After These Messages…We’ll Be Right Back…..
Just a quick check in with why I haven’t posted in a few days. One of my grandmothers died on Monday and I’ve had a fairly hard time since – losing someone I love very much, plus dealing with my father (her son) with whom I really don’t have a relationship, didn’t exactly mix together to make a happy cake. My boyfriend and I went up to his mountain cabin when I got off work on Thursday and just now got back. There’s internet up there and I checked my email but I wasn’t really focused on any other online work. Anywhoo, I’m leaving again in a little bit to spend the evening babysitting my nephew; I’ll be back later tonight and hopefully will do a little blogging. Topics of interest thus far…..
LeAnn Rimes and her husband Dean Sherement have separated just days after Eddie Cibrian’s wife left him. Octomom has signed a deal for a reality TV show, and her kids will make about $250 a day. A secret stash of drugs was found in a closet in Michael Jackson’s house – the police were directed to look there by Dr. Conrad Murray. Ok, into the shower and then off to my sister’s house. 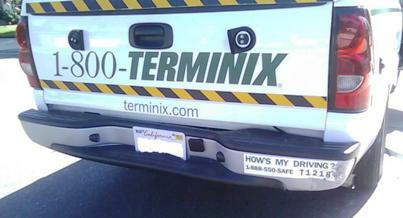 Here’s a funny picture…..my friend’s car was hit the other day by this truck. The damage to the truck is on the far right of his fender…..